Two episodes of this series have aired so far. Like most things done for the public on Houdini, it’s filled with questionable facts. 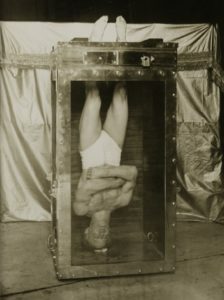 The first episode is about revealing “the real secret” of Houdini’s Water Torture Cell. That secret has actually been published, but you would never (fortunately) know that from episode 1 of the show. I saw the actual Houdini Water Torture Cell at the Houdini Museum in Niagara Falls before it got torched. It was much smaller than expected and quite claustrophobic—no doubt part of what created the tension when Houdini was upside down in it and the top of his head seemed to almost touch the bottom of the tank. The second episode is about the Bullet Catch, a trick which Houdini may or may not have done. Can there actually be any tension in watching someone (definitely not the charismatic Houdini) perform this trick on a TV show? Of course not: they’re not going to broadcast someone getting their brains blown out. There’s also that nonsense about Houdini being a spy. Regardless of what the ratio of truth to nonsense is in this show, so much of what is wrong with with modern culture is captured by noting that this ostensibly factual series is being shown on THE SCIENCE CHANNEL. Cox, writer of the excellent “Wild About Houdini” website, has noted that you can purchase the series of the four-show series (42 minutes per show) on either Amazon amazon or iTunes. Episodes are $2.99 each, the series is $9.99. Personally, I’d rather buy some chocolate!